Our range of products include centrifugal pump, centrifugal transfer pump, centrifugal metal pump, centrifugal water pump and centrifugal process pump for evaporators. Centrifugal Pump is a horizontal single end suction standardized back pull out process pump in accordance with DIN 24256 / ISO 2858. 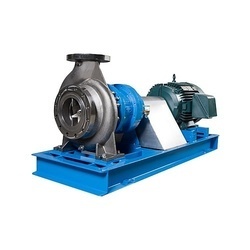 The PCF series process pumps are a single piece, self-venting radically split volute casing with vortex discharge, close redial impellers have back vanes for hydraulic balancing & reducing stuffing box pressure. Dry shaft construction preventing liquid contact with the shaft. Featuring precision constructed design, these Centrifugal Transfer Pump options support creation of vacuum between impeller and mechanical seal with less pressure maintained on seal face that minimizes wear and results in longer seal life. Also coming with continuous lubrication support, the wet seal design offers safeguards to pumps from dry runs for extended time periods. Some of its advantages include closed impeller design, minimized thrust loading on drive motor, thick cast walls for extended service life and others. Finding suitability for handling aggressive, cold as well as hot liquids, Centrifugal Metal Pump options offered feature precision designed motor shaft extension and standard motor support which provides for consistent performance. In compliance with defined industry standards, these are available with different delivery rates, single / three phase power supply, capability to handle temperature of pumped liquid from -10 °C to 120 °C and others. Some of the end applications these are used in include for commercial-water, water boosting, water treatment plants, light process industry and others. 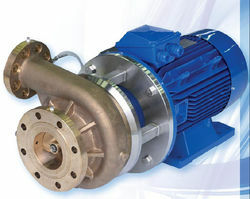 Coming in simple construction designs and fewer moving parts, these Centrifugal Water Pump options come with adjustable impeller and impeller cover that help in maintaining peak performance. 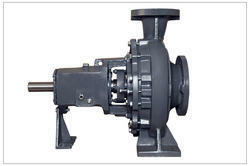 Further, its durable body construction as well as lightweight finish also makes these pumps highly demanded in the market. Some of its benefits include high flow rates, ideally suited for common transfer applications, offering superior flow rates and others. We can also offer these in other models for efficiently handling of highly corrosive chemicals. Some of its advantages include quick installation, excellent pulse-less flow support and others. Some of its application areas include cooling tower transfer, for feed pumps, for general fluid transfer, for pilot plant processing and others. Finding suitability for handling aggressive, cold as well as hot liquids, Centrifugal Process Pump For Evaporators options offered feature precision designed motor shaft extension and standard motor support which provides for consistent performance. In compliance with defined industry standards, these are available with different delivery rates, single / three phase power supply, the capability to handle the temperature of pumped liquid from -10 °C to 120 °C and others.